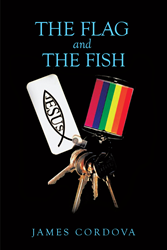 “The Flag and the Fish” from Christian Faith Publishing author James Cordova is a touching story about Nick James, successful hotel and casino employee and a single man living in Las Vegas who has found his issues with his sexuality and his faith underneath his happy façade and how he overcomes this conflict with God’s love. “The Flag and the Fish”: a poignant book about a man’s identity crisis and the painful experiences and moments of clarity that lead him back to Christ. “The Flag and the Fish” is the creation of published author, James Cordova, a hotel concierge for over a decade who has a degree in interior design. Cordova shares, “The sound of keys hitting the asphalt allowed me to turn my focus from the sky. I reached towards the ground and both keychains struck me. The pride rainbow and the Christian ichthus sat attached to the ring. Just then the cashier’s words echoed in my mind: a storm is brewing. I stared at the flag and the fish as they lay side by side. I thought to myself, should these two symbols be next to each other? Is it possible that I can get them to co-exist in my life? With my other hand I touched the flag, its colors aligned in natural harmony; red, orange, yellow, green, blue and purple. I then touched the keychain with the fish. It was simple and unassuming. I could feel something on the back of the fish keychain. It is another engraving, one that I must have overlooked. I turned it over and the phrase starting back at me that took me by surprise. Fear not, my child, for I am with you. Published by Christian Faith Publishing, James Cordova’s new book honestly narrates a gay man’s struggles in realizing his identity in Christ; its honesty also reaches out to the members of the gay community who have problems with their sexuality and spirituality, as well as with how Christians treat them. Cordova also incorporates the challenges that arise when a person chooses to stand on his or her faith in the story. Nonetheless, beyond all human conflict—whether internal or external—God is always the powerful savior who gives the clarity everyone needs. View a synopsis of “The Flag and the Fish” on YouTube. Consumers can purchase “The Flag and the Fish” at traditional brick & mortar bookstores, or online at Amazon.com, Apple iTunes store, Kobo or Barnes and Noble. For additional information or inquiries about “The Flag and the Fish”, contact the Christian Faith Publishing media department at 866-554-0919.